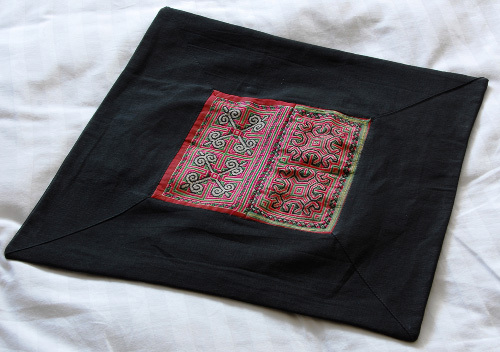 This beautiful raw silk pillowcase is decorated with antique tribal batik and appliqué of the Hmong people, an ethnic minority living in the northern mountain region of Vietnam. Knot closure is on the reverse. Border color combinations vary. 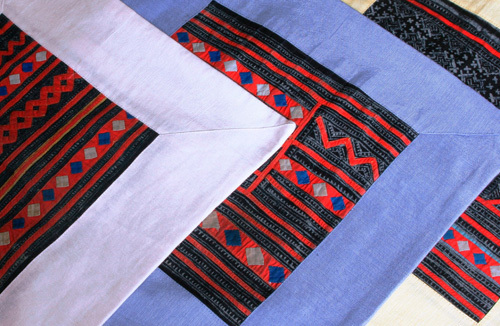 Made by young disabled artisans at The SPIRAL Foundation Workshops in Hue, Vietnam, all net proceeds from the sale of this item fund medical programs of OGCDC (Office of Genetic Counseling for Disabled Children) Hue Medical College, Hue, Vietnam. Since 2003 the purchase of items produced at The SPIRAL Foundation Workshop in Hue has helped fund 230 heart surgeries of poor Vietnamese children affected by congenital heart disease.